Yellowstone National Park has to be seen to be believed. Standing in the midst of somewhere truly magical has to be on the holiday bucket list. 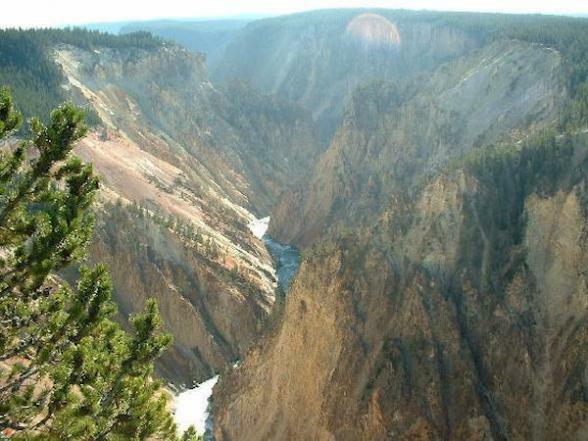 Yellowstone was designated the world’s first national park in 1872. It is a UNESCO World Heritage Site as well as a Biosphere Reserve. Covering more than two million acres, it is the largest national park in the lower 48 states. To really get under the skin of the park, it takes time to explore, but don’t let that put you off. If you have just one day, it’s still easy to tick off all the major sites. What makes Yellowstone stand head and shoulders above the rest is it’s mesmerising geothermal features. Take in the super-volcano’s hidden power through colourful hot springs, erupting geysers and bubbling mud pots. 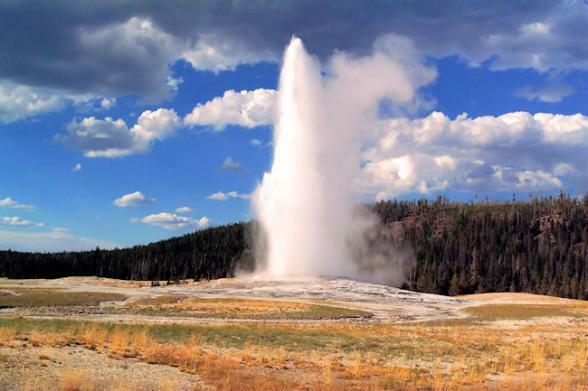 Overall Yellowstone possesses almost 60% of the world's geysers. 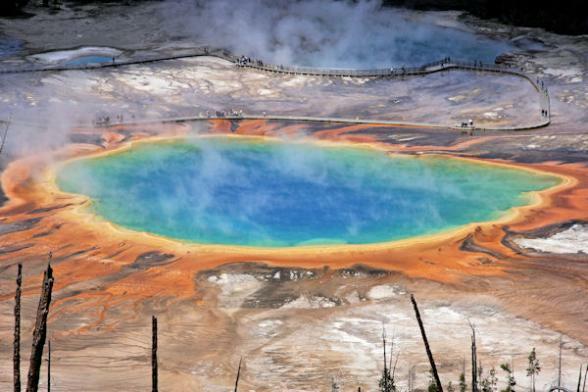 From the reliably frequent eruptions of the aptly named,Old Faithful Geyser, to the terraces of Mammoth Hot Springs , Yellowstone National Park is a geologist's dream. The Upper Geyser Basin is home to the largest number of these hydrothermal wonders. Watching Old Faithful erupt here is a Yellowstone National Park tradition and takes place approximately every 90 minutes. Old Faithful shoots from 17,000 to 38,000 litres of boiling water into the air for one and a half to five minutes at a time. You can enjoy this spectacle from the nearby benches or take the short walk up to Observation Point to view it from above. Midway Geyser Basin along the Firehole River, holds the two largest hot springs in the park. Excelsior Geyser is a huge deep crater measuring 200 by 300 feet constantly discharging more than 18,000 litres of water a minute into the river. 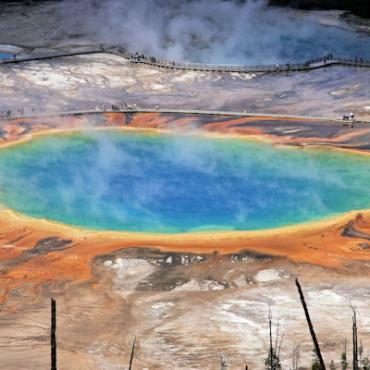 Just along the boardwalk you’ll find Grand Prismatic Spring, Yellowstone's largest hot spring. It’s more than 120 feet deep and a blistering 160 degrees Fahrenheit. Marvel at the deep blue centre of the pool contrasting with the warm oranges and red around the edge. Still haven’t got your fill of geysers? Stop at Lower Geyser Basin to stroll along the boardwalk trail at Fountain Paint Pots or head to Norris Geyser Basin, the oldest, hottest and most dynamic of Yellowstone's thermal areas. This is where you’ll find Steamboat Geyser, the tallest geyser in the world rising between 300 and 400 feet. To the north is Mammoth Hot Springs and nearby Boiling River. Fancy a dip after a long day exploring? Boiling River is where a large hot spring enters the Gardner River mixing to a comfortable soaking temperature. This hotspot is closed in the spring and early summer when the height of the river is too dangerous to bathe in. Wildlife enthusiasts are also well catered for as Yellowstone boasts more than 60 different mammal species and numerous bird species. Bison, bears, otters, coyote, elk, moose, bald eagles and much more call the park their home. Most are crepuscular – meaning they are most active at dawn and dusk, away from the heat of the day. If you’re an early bird, this is the time to explore as it’s also one of the quietest times in the park. If you’re not a morning person, save some time in the evening to dedicate to wildlife spotting. Any time of day, be sure to remember that these animals are as wild as the landscape they live in. 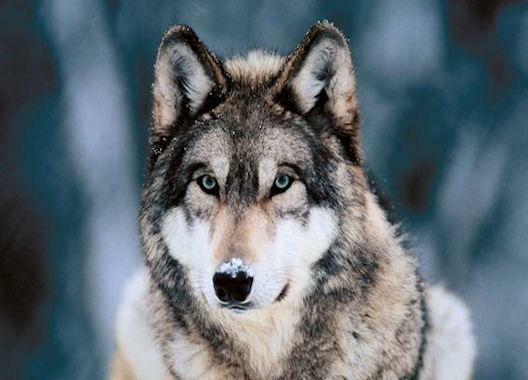 In the 1990’s wolves were re-introduced to Yellowstone. Today, the best place to see and hear these magnificent creatures is in the Lamar Valley to the north east of the park. Join a specialist guided tour at dusk to discover more. 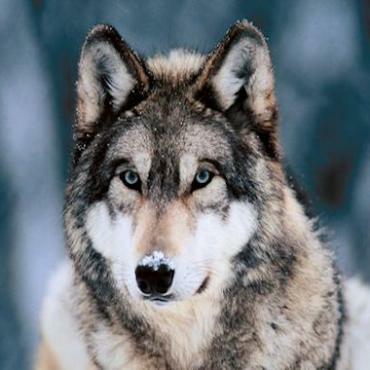 Even if you’re not lucky enough to see or hear the wolves, it is also a popular habitat for bears, elk, bison, pronghorn and eagles. And if all this isn’t enough, you can't miss the Grand Canyon of the Yellowstone, one of Yellowstone’s most breathtaking sights. A huge volcanic eruption approximately 600,000 years ago formed this 20-mile-long canyon which is up to 1,200 feet deep and 4,000 feet wide. Artists’ Point offers dramatic views along the canyon towards Lower Falls; 308 feet of thundering water more than twice the height of Niagara Falls. 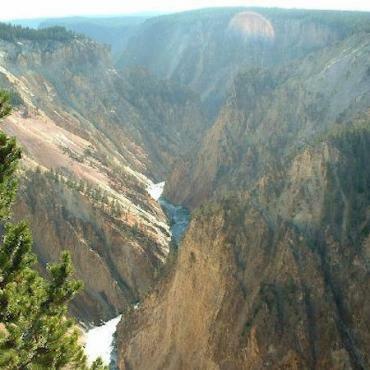 Whatever time of year you visit, Yellowstone will enthral and excite. In the summertime, it is full of new life, colour and the weather is at its warmest. It is also at its busiest, so why not aim to visit in late spring or early autumn? Winter offers a completely different perspective. Travel through the park on a snow coach or snowmobiles. Cross country ski or snowshoe on miles of groomed trails, view the wildlife or simply sit back, relax and enjoy the serene peace. Whenever you choose to visit, you’re guaranteed to leave a little piece of your heart in Yellowstone National Park. Considered the largest log structure in the world, this is the closest location to the actual geyser. The comforts of home with the perks of a hotel. 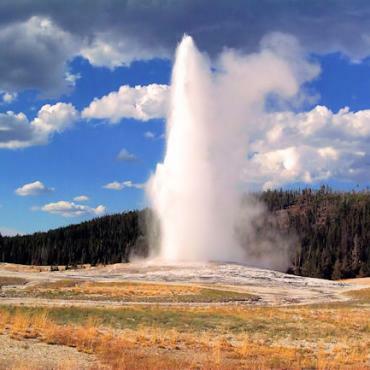 The perfect location for families and only a short drive to Old Faithful. Only six miles from the West entrance of Yellowstone, this 200 acre hideaway is a real treat.